In large nonstick saucepan, melt margarine over medium heat. Add bell pepper, onion, garlic and flour; cook and stir until flour is light golden brown. Add remaining ingredients. Bring to a boil. Reduce heat to medium-low; cover and cook 10 minutes. Uncover; cook an additional 10 to 15 minutes or until okra is tender, stirring occasionally. Remove bay leaf. Gumbo, a peppery chicken or meat stew, is a mainstay of Creole cooking. The traditional preparation is thickened with okra of filé powder and thickened further and flavored with a browned flour mixture called roux. Bay leaf, the dried leaf of the bay laurel tree native to the Mediterranean, adds pungent flavor to soups, stews, dried bean dishes and more. Along with parsley and thyme, bay leaf is a component of the classic French seasoning blend known as bouquet garni. Because the edges are sharp, bay leaf should be removed before the soup is served. Gumbo is incredibly popular in the state of Louisiana—it is the state’s official dish, after all! 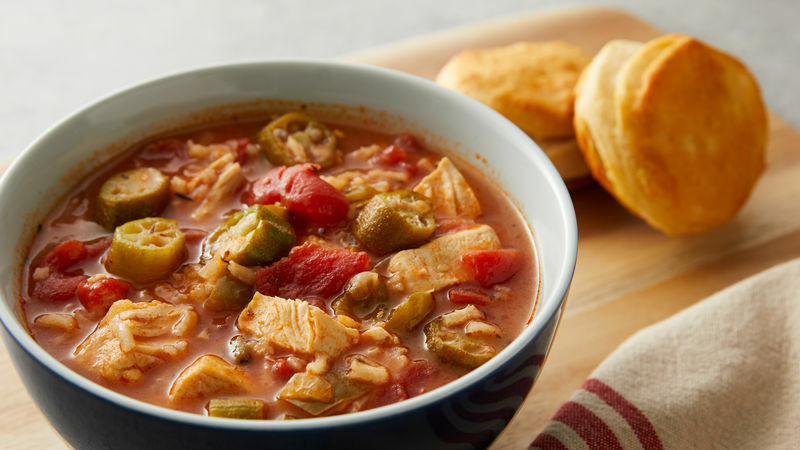 Gumbo is usually characterized as a soup or stew that features a few key ingredients: okra, a protein like meat or shellfish, vegetables, and a roux. Some people confuse gumbo with jambalaya, but they’re not the same! Jambalaya is often compared to Spanish paella. It’s primarily a rice dish that’s made with different meats and/or shellfish and vegetables, but unlike gumbo, it’s not made with okra and is not stew-like. Now that you know the gumbo basics, it’s time to try this delicious chicken gumbo recipe. And once you’ve tried that, check out all of our other yummy chicken soup recipes, and our favorite ways to dress them up.